Elementary students are taught that there is very little difference between the words MUST and HAVE TO. Little as it may be, it exists. And in this post I would like to give you several rules which will help you decide which one is better in the given sentence. In this short post you will find an infographic, two online quizzes and a worksheet. The common explanation of the difference sounds like this: You use MUST to give your own opinion. HAVE TO is used to give obligations imposed by some outside authority. However, in this post I will give you a different explanation. It is based on the explanation given by Jim Scrivener in his book Teaching English Grammar. There he states 5 rules which should help learners decide which verb to use. The rules are summed up in the following infographic. Remember, that you can often use the verb HAVE TO instead of MUST but it may not sound completely natural. In the following quizzes students should complete the sentences with the words MUST or HAVE TO in the correct form. Sometimes both of the answers are correct. Must and Should – this is one of the most popular posts at this site. There is a nice board game to practise the verb Must here. 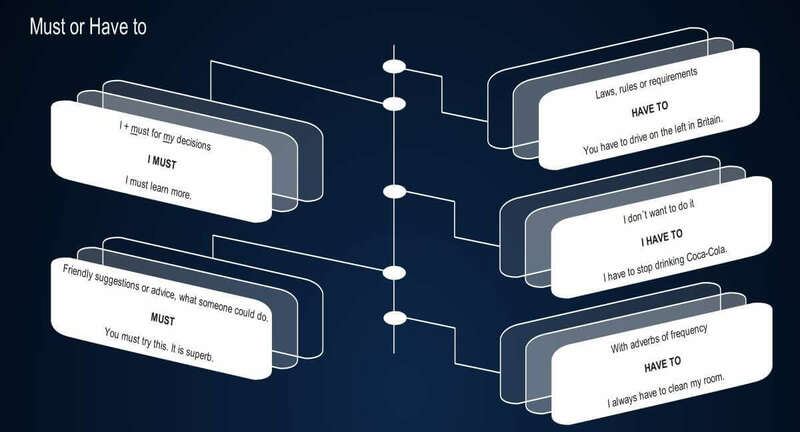 At http://www.engames.eu/past-tense-of-modal-verbs/ you can find the past tenses of the modal verbs. And there is a great infographic explaining the usage of the verbs HAVE TO, DON´T HAVE TO and MUST here.